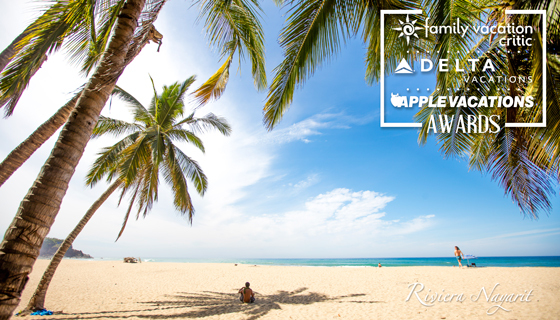 Eight of the area’s hotels received Golden Apple Awards, four received Quality Assurance awards and two of the destination’s resorts were numbered among the top 60 family-friendly hotels in Mexico. This month some of the most important tour operators in the United States announced the winners of the awards their companies give to the best performers in the global tourism industry. As they do every year, the Riviera Nayarit’s hotels received their share. On September 13th Apple Vacations handed out its Golden Apple Awards in Chicago, Illinois. The winners were: Marival Residences, Marival Resort, Grand Velas Riviera Nayarit, Grand Palladium, Iberostar Playa Mita, Hard Rock Hotel Vallarta, Dreams Villamagna and Riu Pacífico. The Delta Vacations University event was held September 17-18 in Atlanta, Georgia, during which they gave out their Quality Assurance Awards. Among the winners were four of the Destination’s hotels: Riu Vallarta, Riu Palace, Hard Rock Hotel Vallarta and Iberostar Playa Mita. DMC Traffic Tours, which provides service in the region, also received this award. Cielo Rojo Hotel at San Pancho and Hard Rock Hotel Vallarta at Nuevo Vallarta, were chosen among the 60 favorite family-friendly hotels in Mexico by Family Vacations Critic.